KRUGER, Barbara. Picture/Readings. Self-published, 1978. Oblong 8vo; illustrated throughout in black and white; printed wrappers. Near fine. First edition. 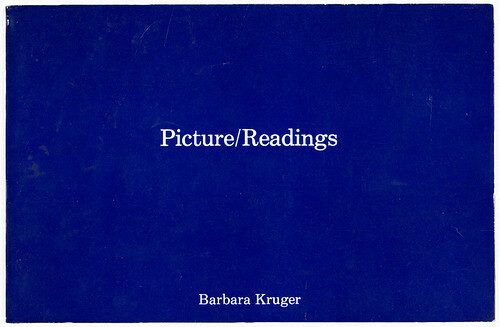 This book is an early work that shows Kruger developing the use of text in combination with image to address her abiding artistic interest, the interplay between public space and private consciousness. As she herself put it, “Picture/Readings was an early indicator of my interest in exterior and interior spaces and how they form us as much as we form them.” Kruger found the book an ideal venue to explore this dichotomy. Each text-and-image diptych consists of the exterior of a dwelling pictured opposite a speculative narrative about the inhabitants. This work, both thematically and in the use of a democratic, unprecious medium, prefigures the signature style Kruger would later arrive at in the eighties. Her iconic works--many appearing as posters, billboards, or magazine covers--were stark designs of black, white and red combining high-contrast photographs with pointed phrases spelled out in a signature typeface, Futura Extra Bold Italic. Perhaps because it was so striking, and thus became an ubiquitous emblem of the decade, Kruger’s work was sometimes faulted as “mere design," but this criticism fails to recognize that though her work deployed the principles and techniques of design, its real substance of lay in its critique of society and engagement with the public sphere. Though this book precedes the stylistic maturity that would make her widely known, the seriousness of Kruger’s work is already perfectly clear.